Bolzern et al. 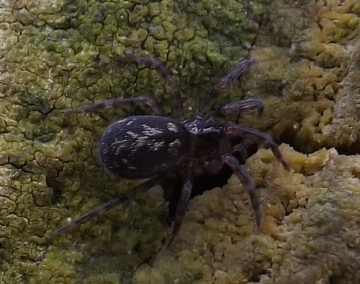 (2013) proposed that Tegenaria atrica, T. saeva and T. gigantea (= T. duellica) should be placed in a new genus, Eratigena (together with T. agrestis and T. picta amongst British spiders). They further proposed that E. atrica, E. saeva and E. gigantea represented just one species, E. atrica. While the transfer to a new genus is justified, the collapse of the three species into one is definitely not (see Oxford & Bolzern 2018 for details). Here the genus Tegenaria, and gigantea rather than duellica, are retained until the SRS master list is updated. For a long while, T. atrica was thought to occur in Britain solely as a result of occasional imports. In 2009, however, Smith & Oxford (2009) reported a self-sustaining population in Burnopfield, Co. Durham. Subsequent surveys revealed a very large population of this species spread across some 700 square kilometres centred on Newcastle upon Tyne (Oxford & Smith 2014). The Newcastle population almost certainly originated from spiders accidental imported during Victorian times (Hull 1896). Other populations may yet be discovered. The species is widespread across the whole of continental Europe (Maurer 1992) and is common in the Irish Republic, but not Northern Ireland (Oxford & Chesney 1994). This curious distribution is probably a result of historical human importation into the Irish Republic from continental Europe. The habitat and ecology of this species seems to be identical to that of T. gigantea and T. saeva (q.v.). Older records may refer to T. saeva/gigantea - the naming of these species has, historically, been rather fluid. In Britain, odd specimens are occasionally found in locations such as garden centres and post offices, which suggest recent importation from Ireland or the continent. Bolzern, A., Burckhardt, D. & Hänggi, A. 2013. Phylogeny and taxonomy of European funnel-web spiders of the Tegenaria-Malthonica complex (Araneae: Agelenidae) based upon morphological and molecular data. Zool. J. Linn. Soc. 168: 723–848. Hull, J. E. 1896. Catalogue of the spiders (Araneidea) of Northumberland and Durham. Trans. nat. Hist. Soc. Northumb. 13: 57–107. Oxford, G. S. & Bolzern, A. 2018. Molecules v. morphology – is Eratigena atrica (Araneae: Agelenidae) one species or three? Arachnology 17: 337–357. Oxford, G. S. & Chesney, H. C. G. 1994. Large house spiders Tegenaria spp. in Northern Ireland: previously overlooked species or recent introductions. Ir. Nat. J. 24: 354–357. Oxford, G. S. & Smith, C. D. 2014. Distributions of species in the Tegenaria atrica group (Araneae: Agelenidae) in north-east England: chance, contingency and priority. Arachnology 16: 145–153. Account last edited by Geoff Oxford at 16:02 on Fri 22nd Jun 2018.